lady in casual outfit walking trough the residential quarter. she is wearing blue headphones on her neck. lady wearing casual outfit stands in the fairground. her face is covered with freckles. woman in casual outfit enjoying new day by morning walk. she wears blue headphones on the neck. lady waiting for somebody wearing her headphones on the neck. female person wears purple shirt. woman passing parking lot in residential quarter. she listening to the audio book in her headphones. 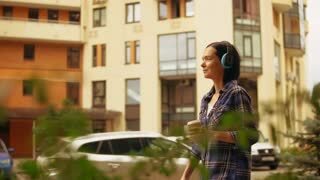 lady wearing blue headphones walking through the residential quarter. brunette female against yellow buildings with bokeh effect background. brunette lady wearing casual outfit is climbing the stairs. female looks cheerful and happy. brunette lady passing by the parked cars and shops. girl is wearing casual outfit.